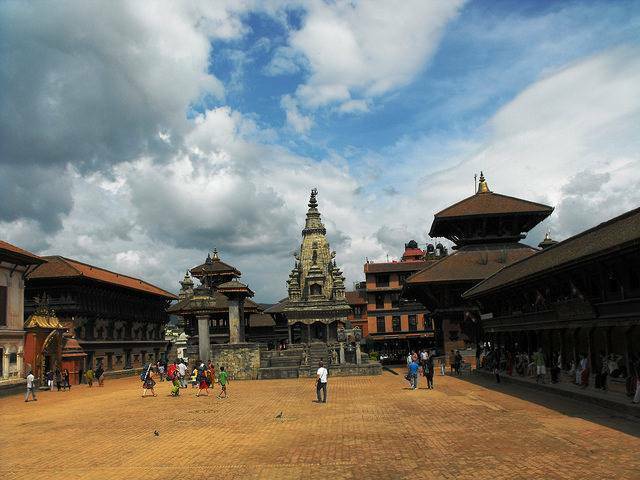 Bhaktapur Durbar Square is situated in front of the royal palace of the then Bhaktapur Kingdom. It is one of the three Durbar Squares in Kathmandu Valley which are a great tourist spots. The place is known for its wood carving, architecture and medieval art. There is a lot to see at the Durbar Square. The 55 Window Palace is a queer building with 55 windows, considered to an extraordinary masterpiece of wood carving. The Lu Dhowka (The Golden Gate) is known for its elegant and richly sculpted specimen of its kind in the whole world. Apart from the beautiful examples of the architecture of this place, the Mini Pashupati Temple is also worth seeing. It is a shrine dedicated to Lord Shiva with a nice folk‐lore linked to it. Also there is Batsala Temple nearby, which is famous for its historical bronze bell which still remains intact even after the earthquake.